The guitar that a young Bob Dylan played at the 1965 Newport Folk Festival when he famously went electric - perhaps the most historic instrument in rock 'n' roll - is coming up for auction, where it could fetch as much as half a million US dollars (£311,500). Though now viewed as changing American music forever, Dylan's three-song electric set at the festival which marked his move from acoustic folk was met by boos from folk purists in the crowd who viewed him as a traitor. He returned for an acoustic encore with It's All Over Now, Baby Blue. Now the sunburst Fender Stratocaster is being offered for sale on December 6, auction house Christie's said in New York. Five lots of hand- and typewritten lyric fragments found inside the guitar case - early versions of some of Dylan's famous songs - also are being sold. The lyrics have a pre-sale estimate ranging from 3,000 US dollars (£1,870) to 30,000 US dollars (£18,700). With a classic sunburst finish and original flat-wound strings, the guitar has been in the possession of a New Jersey family for nearly 50 years. Dylan left it on a private plane piloted by the owner's late father, Vic Quinto, who worked for Dylan's manager. His daughter, Dawn Peterson, has said her father asked the management company what to do with the guitar, but nobody ever responded. Last year, she took it to the PBS show History Detectives to try to have it authenticated. The programme enlisted the expertise of Andy Babiuk, a consultant to the Rock and Roll Hall of Fame and owner of a vintage instrument shop, and Jeff Gold, a Dylan memorabilia expert. Both men, who appeared on the episode, unequivocally declared the artefacts belonged to Dylan. Mr Babiuk took the instrument apart and compared it to close-up colour photos of the guitar taken at the 1965 festival. "I was able to match the woodgrain on the body of the guitar... and the unique grain of the rosewood fingerboard. Woodgrains are like fingerprints - no two are exactly alike," Mr Babiuk said in an interview. "Based on the sum of the evidence, I was able to identify that this guitar was the one that Bob Dylan had played in Newport." Dylan and Ms Peterson, who declined to be interviewed, recently settled a legal dispute over the items. The terms of the settlement were not disclosed but allowed Ms Peterson to sell the guitar and lyrics, according to Rolling Stone, which wrote in July about her quest to authenticate the guitar. "Representatives for Bob Dylan do not contest the sale of the guitar, and are aware of Christie's plan to bring it to auction," a statement issued through Christie's said. Festival founder George Wein told the Associated Press that when Dylan finished playing, he told him to go back out and play an acoustic number because that was what people expected. Dylan said he did not want to do, and could not do it because he only had the electric guitar. Mr Wein called out for a loan backstage, and about 20 musicians raised their acoustic guitars to offer them. Dylan "going electric changed the structure of folk music", Mr Wein, 88, said. 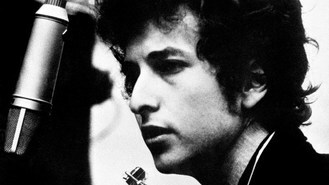 "The minute Dylan went electric, all these young people said 'Bobby's going electric, we're going electric, too'."